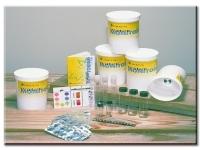 Introductory kit for use in brackish, fresh or ocean waters. Tests eight factors, including pH, dissolved oxygen, biochemical oxygen demand, temperature, clarity (turbidity), nitrate, phosphate and coliform bacteria. Kit for designing and implementing a river study. Tests nine factors, including pH, Dissolved Oxygen, Biochemical Oxygen Demand, two temperature ranges, Clarity (Turbidity), Nitrate, Phosphate and Coliform Bacteria. 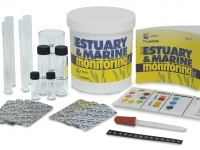 Kit contains items required for undertaking a field trip and measuring water quality, including tests for pH, Nitrate, Phosphate and Dissolved Oxygen. Basic kit for testing saline and brackish water. Tests include pH, Dissolved Oxygen, Biochemical Oxygen Demand, Temperature, Clarity (Turbidity), Nitrate, Phosphate, Chlorine and Coliform Bacteria.